Hydroponics is simply growing plants in a liquid-based growing medium without the soil. 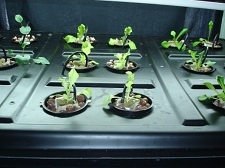 Benefits of hydroponic gardening include a more controlled environment without running the risk of introducing soil-based insects or diseases, complete control over the amount of nutrients each plant receives (no fighting with weeds for nutrients), and better control over the space used since there's no need for root spread. Starting your own hydroponic garden takes time and attention, but once running successfully, your new garden can yield excellent results. Although these are some helpful tips in starting your hydroponic garden, we recommend coming in to the store or calling us to discuss your growing project. This will allow us to better understand what you are trying to accomplish and we can lead you down the right path. We are here to help gardeners grow successfully the first time by offering the proper equipment and the right information. » Tomatoes, peppers and herbs are perfect for beginners. Order seedlings for hydroponics that have been started without soil, or gently wash away soil from the roots in a steady flow of water until free of dirt. » Use a hydroculture pot, a double-walled pot, or a simple glass container for just a couple plants. Single plants in a container filled with marbles or polished stones makes an interesting decoration. » Anchor plants in the pot with vermiculite, rock wool or gravel. Each of these mediums contain no nutrients, but give the plant the same support that soil would. » Mix the hydroponic solution per the instructions on the packaging. Hydroponic fertilizing mix will provide all the main and minor nutrients that a plant grown in proper soil would receive. » Place the fish bubbler into the pot as instructed on the packaging for a fish tank. This allows a steady supply of oxygen to the plant's roots. Lay marbles, polished rocks or clean gravel over the support medium for a more desirable look. » Monitor the pH level of your solution on a regular basis, and change your solution as instructed by your particular brand, usually every two weeks.